Between American Foulbrood, two types of mites, and the recent hive beetle, there has been a dearth of bees. Many areas are reporting zero wild bee populations!? This makes the use of honeybees for pollination ever more important. 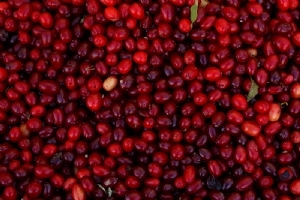 Without honeybees, cranberry bogs produce approximately 15 berries per square foot. With pollination, they produce up to 150! This makes a huge difference in the price we pay for our cran-fruit drinks and holiday cranberry sauce. Cranberry farmers typically lease 1-2 hives per acre for this increase in fruit production. It can be tricky to get Cranberry Honey, since other plants with more abundant nectar bloom at the same time. Farmers will often mow the areas around their cranberry bogs to encourage the bees to work only the cranberries. Cranberry Honey is prized for its strong berry flavor without the harshness of the cranberry. In addition, Cranberry Honey has a beautiful red cast when held up to the light! Cranberry Honey has a strong berry taste, without the tartness of the cranberries. Excellent for pork, bird, or fish. This is raw honey.